SCCA is a non-profit organization that is run by artists and art enthusiasts. Meet our team of talented art lovers who work hard to provide you this amazing studio! Joy holds a Master of Arts in Museum Studies from The Johns Hopkins University, an MBA from Lee University, along with a Bachelors in English from Milligan College. A native of southeast Tennessee, she loves working in Chattanooga supporting the arts and local artists. Before coming to SCCA, she spent over 10 years in nonprofit education and leadership in a public library, academic library, national museum, Smithsonian Institution, local history museum, and university instruction. She continues to teach Museum Studies at Lee University. Her passion is working with artists to help them be successful and share their skills with others through both production and education. Joy lives in Cleveland, TN with her husband and two dogs. Emily has been the Studio Manager of SCCA since November 2018 and helps keep the studio running efficiently and effectively. Prior to holding this position, Emily was a Studio Assistant since August 2018 and an active member of the studio since September 2017. She holds a Bachelors of Arts in Public Relations from Auburn University, and completed an internship with Annie Hanks Ceramics in Chattanooga in the Fall of 2017. This internship is where she learned the basics of clay and how a studio functions well. Armed with her marketing experience and love of ceramic arts, Emily’s goal is to continue to cultivate an open and collaborative community within Scenic City Clay Arts. I believe that the arts can make a difference. “Art brings new perspective on things. It adds excitement to a life that might be black and white and it also brings dialog. You never know who’s going to respond to your work, positive or negative. My approach to creating a work of art is based on the “less is more” concept. Simple forms in clay are tagged with imprinted impressions. The reverse design impressions become the foundational support for glaze applications. In printmaking everything’s reversed. When growing up, I didn’t understand why I was struggling with school;but when I went to college and got into printmaking, it all began to make sense- I had dyslexia. As a printmaker/marbler on cloth and paper, my most recent exploration is in surface design, mono-type printing with Acrylic inks on a water-based sizing. My product is one-of-a-kind motif design that is affordable. Easy to display and easy to mail. The very nature of water adds fluidity to creating a pot or pulling a hand-printed, marbled pattern from a water-based sizing. Creating art;be it pottery or marbled, hand-printed cloth restores my capacity for wonder, scientific exploration and experimentation. Loren has worked professionally in multiple media from film, set design, bronze and multiple large sculptures. After receiving a BS in computer animation in 2003 he fell in love with the tactile nature of clay and 3 dimensional design which moved his work from digital toward experimental week long wood firings, atmospheric firings, Japanese, and Chinese aesthetics, and the firing techniques and glazes they used. Experimentation developing new techniques as well as learning old techniques is more important to him than the finished product. Mark is a prolific potter with decades of experience under his belt. An ex-firefight turned potter, Mark has serious attitude to pottery, along with a wealth of knowledge to provide to his students. Featured in Ceramics Monthly, and several simular articles, Mark brings with him expertise and a love of ceramics to those who truly are dedicated potters. Julie, a native of East Tennessee, earned a BA in International Studies from UT Chattanooga in 2007. She first came to ceramics as a Work Study student at the John. C. Campbell Folk School in Brasstown, NC in 2011. Though she initially went to the Folk School to continue her studies of spinning, weaving, and fiber dying, she was lured into the messy, muddy world of pottery and hasn't looked back! 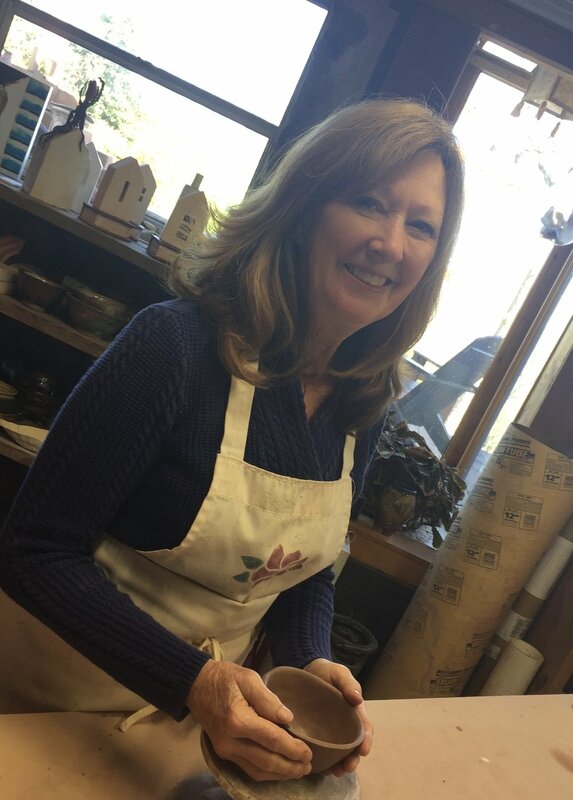 Through apprenticeships and pottery explorations all over Western North Carolina, she has had the privilege of seeing a wide variety of ceramics making and gained experience in electric, salt, soda, wood, and raku firings. As a studio apprentice at The Village Potters studio in Asheville, NC, she began to hone the surface design techniques and vibrant colors that define her current body of work. She loves to take her surfaces on a design journey, applying her love of illustration, graphic design, and print making through sgraffito, stamping, screen printing, resist, and more. Julie has been teaching ceramics to kids and adults since 2012, and she loves sharing the creative journey of making with others! Since childhood, Nicole has always been a maker. Most days she could be found drawing, making friendship bracelets, or creating interesting designs with a Spirograph set. As a creative teen, Nicole could be found in her High School Art room helping with special projects and learning how to run and load the kiln. As a four year Hope Scholar, she went on to study Art and play softball at Gordon College in Barnesville, GA. After obtaining her Associates in Art, Nicole continued her education at Georgia State University (GSU). At GSU, while studying ceramics, she was exposed to several different art genres including; printmaking, life drawing, and fiber arts. While she excelled at using her hands to create the required class projects, Nicole went a step further, and infused each project with her own style. After graduating GSU with a BA in Studio Art, Nicole went on to teach and develop several children's ceramics classes at Pinckneyville Community Center in Norcross, GA.
Nicole has more than 5 years experience teaching children ceramics (hand building & wheel). What's her secret...plenty of patience and a positive attitude help her guide students along during class. She enjoys explaining the ceramic process to new students as well as incorporating the principles of Art and Design into her workshops. Working with clay has a natural calming effect on most students and Nicole understands how to draw out each child's creative ability. Artist Statement: I have been a studio artist and teacher since 1990 concentrating in clay. I make functional pottery, as well as, sculptural pieces. I enjoy the process of working with wet clay, knowing that every movement of my hands and fingers will affect it. A beautiful object can take us out of the rush of practical life into another reality. It is a necessary part of ordinary life. My intention is to make objects which will enrich the lives of the people who see and use them, thus establishing a relationship between the user and the maker. Carrie Anne began making tiles at Wesleyan College in Macon, GA, where she completed a B.F.A. in ceramics and drawing. Following college, she worked as an apprentice to potter Takeo Sudo in Mashiko, Japan. She then earned an M.F.A., with an emphasis in ceramic sculpture, at Virginia Commonwealth University in Richmond, VA. In 1982, she joined the faculty of Alma College in Alma, MI, where tilemaking was a regular part of her 3-d design curriculum. She often had opportunities to collaborate with her students on tile installations for the College and completed a number of large-scale tile installations of her own. Carrie Anne’s figurative drawings and ceramic sculptures are exhibited nationally and have been included in numerous books on contemporary ceramics. Recently, her work has won awards in the Cheongju International Craft Competition in Cheongju, Korea and the Bradley International Print and Drawing Exhibition in Peoria, IL. In 2015, she relocated to her hometown, Chattanooga, where she has set up a new studio. Paul developed a passion for pottery as a senior in high school. This passion truly flourished while he was in college at UT Knoxville studying ceramics. His favorite forms are utilitarian, wheel-thrown pieces that can be used in a daily basis. Paul believes that unique, handmade objects play a vital role in our modern world. They offset the impersonal repetitiveness of mass produced goods, and remind us of our ancient traditions as artists and craftspeople. Paul says "I am drawn to the process of production pottery. Turning a piece of raw clay into a permanent, usable object through the many steps of the process has always mesmerized me, and I become easily lost in concentration while I undertake each piece. I am excited to share my love and knowledge with students at SCCA. This is an inspiring studio to be a part of, with many talented artists of different backgrounds and aesthetic approaches."